Please note: We are open every day of the year except Thanksgiving & Christmas Day. Boston Costume is located at 200 Broadway, Cambridge, MA 02139, in the same building as The Garment District. We are located between Kendall Square & Central Square in Cambridge. Broadway is a major street in Cambridge that starts at the Longfellow Bridge over the Charles River and ends in Harvard Square. For more detailed information on how to reach Boston Costume and The Garment District, including maps, links to bus and MBTA schedules, and more, please CLICK HERE. By Public Transportation: Boston Costume is accessible by both subway and bus. If using the public transportation system we recommend taking the MBTA Red Line to the Kendall/MIT station. We are only 4 blocks from the subway station and the trains run very frequently 7 days a week. If you chose to take the bus many of the bus routes do stop close to the store. Make sure to check the bus times because their frequency varies. From the Mass Pike/I-90: Take Brighton/Cambridge Exit off the Mass Pike. After the toll booth follow the signs to Cambridge. Go straight over the Charles River into Cambridge & continue straight on River Street. Continue straight across Massachussetts Avenue onto Prospect Street. The 3rd light after Massachussetts Avenue is Broadway (the corner has a store 24 & gas station). Take a right. We are at 200 Broadway, three lights down on the right. From I-93/Storrow Drive: Take the Storrow Drive West Exit off of Route 93. Follow the signs to Storrow Drive. Once on Storrow Drive stay in the LEFT lane. The first exit off of Storrow Drive is the Kendall Square exit (LEFT HAND EXIT). Take the exit & take a right at the bottom of the ramp. Cross over the Longfellow Bridge into Cambridge. This road becomes Broadway. We are at 200 Broadway, four lights down on the left. From Harvard Square: Take Massachusetts Avenue (heading north) and go under the Harvard Square underpass. Stay to the far right to get on Broadway. We are two miles down on the right at 200 Broadway. From the Mass Ave Bridge: At the 2nd light on Massachussetts Avenue in Cambridge take a right on Vassar Street. Go down two lights to get to Broadway. Take a left. 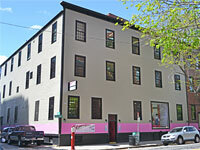 We are on the left three blocks down at 200 Broadway. From North Cambridge/Arlington: Take Massachusetts Avenue to just before Harvard Square. Stay to the left where the road splits apart & the bus depot entrance is. Follow the loop around the bus depot entrance & go under the underpass. Stay to the far right to get on Broadway. We are 2 miles down on the right at 200 Broadway. From Allston: Take Harvard Avenue to Cambridge Street (on the corner is the Sports Depot). Take a right. Follow Cambridge Street straight over the river into Cambridge where it becomes River Street. Continue straight through Massachussetts Avenue where the street becomes Prospect Street. Continue for three more lights to Broadway. Take a right on Broadway. We are at 200 Broadway, three lights ahead on the right.